A new analysis is based on a template (a protocol template). 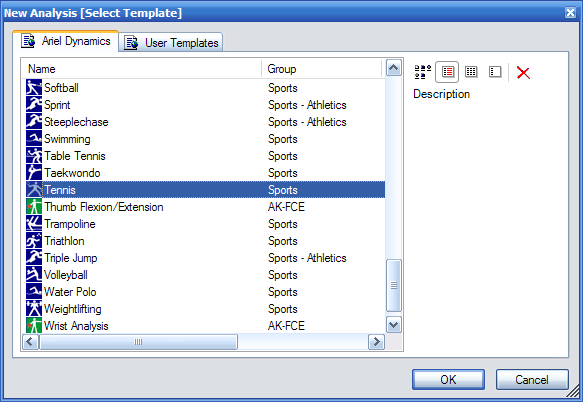 The template determines which analysis is performed, which steps are available in the wizard, which data is to be collected, which points, segments, and clues are available, and which reports can be generated. In the User Templates tab, you can select your own templates. After selecting a template, your analysis must be saved first. This allows APAS/Wizard to establish a working directory. Save the file in the same folder as your data files (if you already have any). After saving your analysis it will be opened in the Wizard window. Generated on 4/25/2019 10:45:09 AM (PST) ADI/HQ/GBA/2019/ARIELCLOUD/v3.0.2018.0126.